Shower drains can easily be clogged with hair and other debris, but fortunately, they are among the easiest fixtures to clear using a drain snake. While a normal bathtub drain is 1 1/2 inches in diameter, a shower drain is often 2 inches in diameter, making it easier to insert a small drain snake directly into the drain opening and down through the trap, where most clogs are found. Sink and bathtub drains, on the other hand, often require that you disassemble the drain trap in order to snake out the clog. 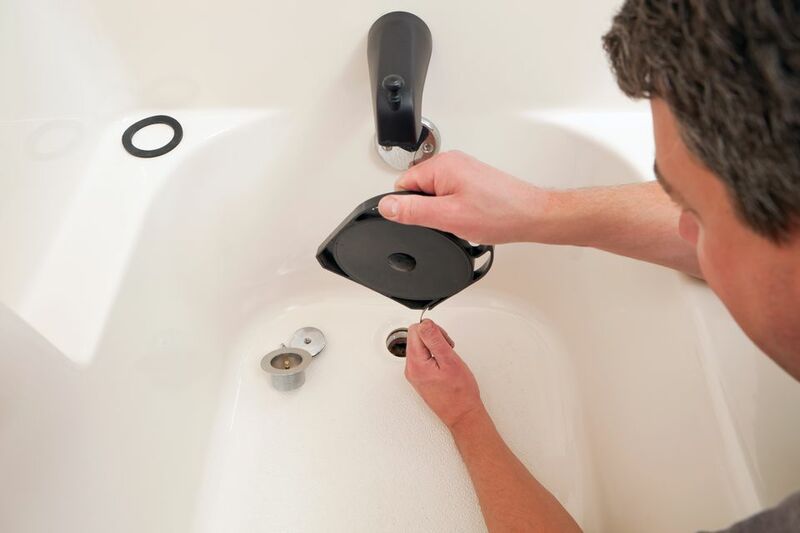 With the right tool and instructions, a clogged shower drain can be cleared in no time. The metal or plastic grate that covers the drain opening in the shower is usually secured with simple screws. Remove the screws and lift away the grate. Clean off any hair or debris that may be clinging to the grate. Run the cable on a small drain snake down into the drain opening until it meets resistance. Tighten the cable-clamp on the handle on the tool and rotate the handle slowly to spin the cable in the drain opening. The cable should begin to auger itself down further into the drain. Do not force it too vigorously or the cable may double back on itself. As the cable extends into the drain, loosen the handle to extend more cable into the drain opening. Retighten the cable and repeat the augering motion to force the cable further into the drain line. It's rare that you will need to go more than a few feet, since most drain clogs will be located in the drain trap immediately below the drain opening. You may well be able to feel the cable when it encounters the clog; rotate the cable to penetrate the blockage and break it up. Run a small flow of water for a minute or so to see if it runs past the snake cable. If water quickly backs up again, try running the snake cable further down the line. In most instances, the clog will be found fairly close to the drain opening or in the drain trap immediately below the drain, but occasionally it may be in the branch drain line running horizontally to the main drain stack. When you feel the cable move past the clog, reverse the direction of the cable rotation and slowly extract the cable from the drain opening. You likely will see hair and debris entangled in the end of the cable as it emerges from the drain opening. Run water for a minute or two to test the drain before putting the shower grate back on. This will flush out any debris that was loosened but not extracted by the drain snake. Continue to run water for a few minutes to flush any remaining hair and debris. Check to make sure that it is only the shower drain that is clogged. If there are fixture drains beyond the shower are also clogged or running slowly, you may be dealing with a branch drain clog or even a main sewer line clog. These more serious clogs will require work with a larger drain snake, inserted from a main clean-out fitting. Do not send the snake cable down through the openings on the shower grate. The grate may be difficult to get off, but unless you remove it, extracting the snake cable can be very difficult once it is entangled with lots of hair and debris. Drain grates are usually fastened by screws, but sometimes they are just pushed in place and can be removed with a little careful prying. Keep an eye on nearby drains. If there is another shower or tub on the other side of the plumbing wall, the end of the snake cable may come up through that drain as you feed it. Have a helper keep an eye on the other drain as you feed the snake.